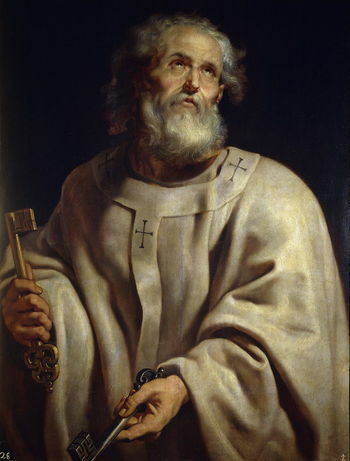 Saint Peter, the Prince of the Apostles, bears the Keys of the Kingdom of Heaven. In the Gospel According to Saint Matthew, chapter 16, verse 17, Jesus says unto Peter, "I will give to thee the keys of the kingdom of heaven. And whatsoever thou shalt bind upon earth, it shall be bound also in heaven: and whatsoever thou shalt loose upon earth, it shall be loosed also in heaven" (Douay-Rheims Catholic Bible). Saint Peter the Apostle, original name Simon or Symeon bar Jona (died c. 64, Rome), was one of the original twelve apostles of Jesus and the first Pope of the Catholic Church. Each of the four gospels of the New Testament contains a list of the apostles, no two of which are exactly the same; nonetheless, in each list, Peter is the first to be named. Before Jesus called him, Peter's name was Simon (or Simeon), and he was a fisherman. He was married, because in the same old songs, it is mentioned that Jesus healed his mother-in-law. At Caeserea Philippi, Jesus gave him a new name. He said: "You are Peter, and you are the rock on which I will build my church." Peter comes from the Greek used in the New Testament and simply means 'Rock'. Peter was quite a rash person, and he lacked courage on several moments. An example: before Whitsun, he didn't dare to come out of the building he and the other disciples where hiding themselves. He also betrayed Jesus by denying three times he knew him. Despite this act, Jesus forgive him, because Peter regretted. At the end of the first letter attributed to him, Peter wrote: She who is in Babylon, who has a part with you in the purpose of God, sends you her love; and so does my son Mark. (Peter 5:13) As it is certain that Peter wasn't literally at Babylon, the eastern city situated in modern-day Iraq, many people suppose this letter was written by Peter from Rome, and so Babylon is a metaphor for Rome. Writing in the 170s, Irenaeus, Bishop of Lyons, says the church in Rome was founded by Peter and Paul. Circa AD 200, someone called Gaius (one of the early Christians) wrote he could exactly point out the place where both Peter and Paul where laid after they died. Paul was buried at the Via Ostia, Peter at the Vatican Hill. Gaius also tells us the spots are marked by monuments. One of those monuments is found right on the spot of what is now the papal altar of St Peter's Basilica. The current altar was built in the sixteenth century, but it was built over earlier altars, going back to the first one, built by emperor Constantine. Beneath that altar, there is a grave that has been dated to the approximate era of the martyrdom of St Peter. The legend said Peter was crucified at circa AD 65 by Emperor Nero. As the tradition said, he should be crucified, but Peter asked to put his cross upside down, so people wouldn't think he was just imitating his master. This page was last modified 21:32, 22 March 2015.